WHO IS THE GOLD BOX FOR? There are many levels to being a Mogul, chose the box that best represents you or the you you're in the works of becoming. 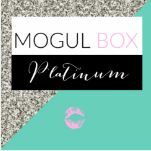 The Gold Mogul Box is for the sassy female who means business. She takes her career and her fun seriously. She is a female with attitude and is committed to grow and succeed in both her career and life. She has an idea of what she wants but needs help with creating her road map. She frequents happy hour and poolside hangouts. CHECK OUT DEETS ON THE PLATINUM BOX IN THE SHOP!